New year’s eve dinner beside the Christmas eve is one that gets the family together in México. Depending on their economic possibilities, some families will say goodbye to the old year with one of the must well Kwon main dishes in these days: a Stuffed Turkey, Tamales, Roasted Pork loin or Baked pork of leg. Usually, the main dish will be accompanied by a salad, mash potatoes, and pasta. I know that it doesn’t sound very Mexican to some, but in my family and many the families I had met in all the different places I have lived in México, that is what they will cook. Besides, this blog gives me an opportunity to share a few sample of the many different ways that food is cooked and enjoyed in my home country, and hopefully, this humble effort will help dissipate some misconceptions about our rich, authentic Mexican food. 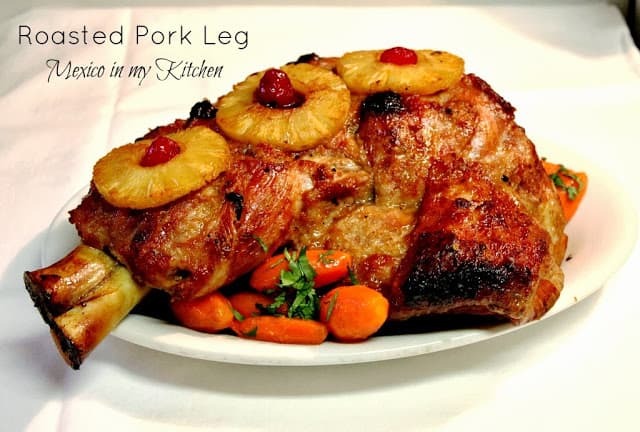 I like this pork leg recipe because it is very easy to cook and the end result is a delectable dish that will impress your guests, even the most demanding connoisseurs. The leftovers, if any, will be great in a taco, sandwich or Panini the next morning. In my family, everyone wants to take some meat home to prepare warm and toasty sandwiches the next day. Will you cook anything for New year’s eve or New year’s day? Do you have any traditions to this date? I know some people like to carry suitcases around the block at midnight believing they will travel a lot the new coming year. In some states of southern México, like Chiapas, Tabasco, and Veracruz, people burn the “old year man” believing that by doing so they are burning all the “bad things” or memories that happened to them in the dying year and will enter the new year with a “fresh start”. The “old year man” is made up of rags and straw like a scarecrow and its size is like a human being. You can see a picture here and a video of the burning here. People “sit” their old year man outside their house several days before December 31st. Just waiting for the end of the year to come and to scare the bad spirits. They stuff firecrackers inside the old man and at midnight it will burn in the middle of the street or in an empty lot. People will gather to watch the lively spectacle and then everyone will hug each other wishing the best for the new year to every one. Now to the recipe, which by the way is adapted from the book “Y la comida se hizo para celebrar”. (And the dinner was made to celebrate) ISBN968-24-1875-5, dated 1984. I know, this has been with me for 28 years. It’s an excellent book that is part of a collection of 9 cookbooks in the Spanish language. With the help of a kitchen, syringe injects the meat (in 4 or 5 points) with 1/4 cup of the wine. Spread the 2 tablespoons of lard on the meat. Place the pork leg inside the oven bag and then in a large baking pan. Mix the pineapple juice with the paste you prepare in the blender and cover the meat. Bake in a preheated oven at 350 for 3 hours. After this time open the bag being careful when opening to avoid a steam burn. Place the pineapple rings and cherries, sprinkle the brown sugar over the meat. Return to the oven and keep cooking for 1/2 hour more basting the meat with its own juices until it is golden brown. With the juices left in the pan, you can prepare a gravy to go along with your mash potatoes. 1 Leg of pork of about 12 pounds skin removed. In your blender place the garlic, chopped onion, salt and pepper with 1 cup of the wine or cider. Blend until it forms a paste and set aside. Using a sharp paring knife make incisions on the meat. 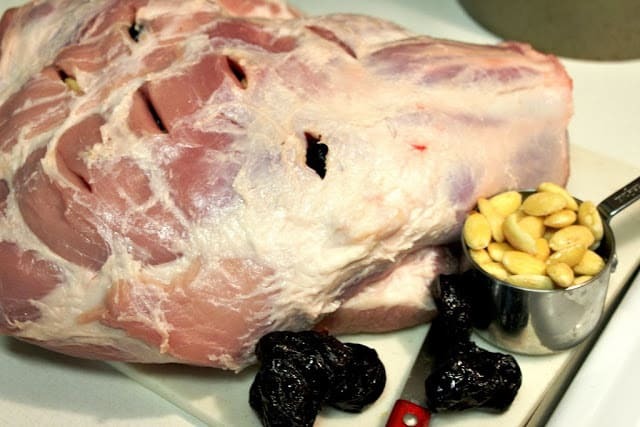 Introduce almonds and prunes inside the incisions you made to the meat. I hope you make them… If you do, please come back to let me know your experience. Se me hizo agua la boca con esto, lo voy a hacer Mely, me encanta debe quedar muy jugoso verdad? saludos y que la pasen muy bien, saludos a tu familia !!! Se me hace que aun estoy a tiempo de hacerlo para el 31. Feliz 2011, para ti y toda tu familia! Aye Mely, me gusta!! 🙂 What a great recipe, thanks so much for sharing. I wish you and your family a very Happy New Year's. Enjoy. Here via Kirby's blog. How did I EVER miss this wonderful blog??????? I will be a regular reader, this roast pork looks "to die for". Happy New Year for you and your relatives! What a delicious looking roast, what a great meal that would be. A very Happy new year to you n ur family , loved going thru ur wonderful blog !!! Mely, what a great recipe! There are many traditions that people follow for New Year's celebration. Some time ago I picked the belief I have to clean the house before I go to bed on New Year's Eve. You can imagine how difficult it is to achieve this after the big party, but I do. The idea is that if you start the new year with a clean house, it will be easier to maintain a clean house throughout the year. It could be superstition but for me it is a fun tradition. Happy New Year and lots of love and health for 2011! This looks incredible ~ Happy new year and looking forward to your awesome creations for 2011! se me antoja un chorro esa pierna! En el DF me acuerdo de unos anuncios de "torta de pierna de puerco al pastor", con piña, cebolla picada y cilantro por supuesto. Que ricura, ahorita me apunto ésta receta, esa se puede hacer fácilmente hasta acá. que bonito se ve..mmm ..feliz año amiga. Mely esta receta no me llegó al correo y me la estaba perdiendo! Te quedó espectacular! Wow! Nosotros hicimos las piernas deshuesadas. La próxima la hare con todo y hueso que ha de quedar más rica. What an absolutely delicious looking way to treat a pork leg. Perfect for a family gathering, and one I hope to sample in person in the near future. Thanks for sharing. Making one now, hope it comes out looking as great as yours. Thanks. Thank you for your comment, come back again to let me know about the final results of your cooking. 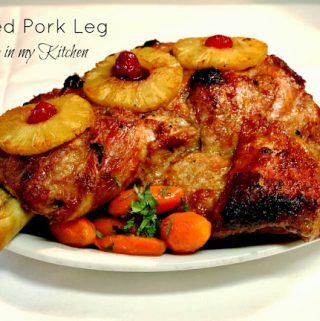 I am a novice in the kitchen and I would love to try this – 3 questions: 1) What can I use instead of lard; 2) after opening the bag to place pineapple rings, etc., is the leg removed from the bag for basting; and 3) can this be done in a slow cooker? Thank you – wish me luck! You can use butter instead of lard, you do not have to remove the leg from the bag, just leave the bag open. I had never tried in the crock pot but it could be done. I don't see why not.